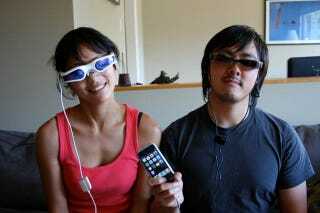 Despite the stigma, I've always wanted a pair of video goggles. I never did mind the nerd factor accompanying any piece of gear, at least not after admiring sci fi heroes like Cyclops of the X-men and Geordi from ST:TNG. But they've never been cheap or high-res enough until now. The Zeiss Cinemizer ($400) and the Myvu Crystal ($300) both do 640x480 resolution, which is best in class. And so today I'll try to figure out which one is better headset. During it all, I will suspend all disbelief when it comes to the practicality of wearing a second screen for your video iPod on your face. I mean, what are you really saving here but neck cramps? I watched lots of snowboarding videos on both setups. Both sets have the same resolution, but the screens look bigger and with less ambient light and distracting reflection in the Zeiss. It's supposed to simulate a 45 inch screen at 6 feet away, but all I know is that it's a lot more in your face than the Myvu. The Zeiss and Myvu's brightness, contrast and black levels were on par with each other. I do wish they came in 16:9 versions, but the 4:3 ratio is probably more practical. There's a 3D setting on the Zeiss, which is to be used with clips provided on their website, but as most content isn't 3D, it didn't factor into my testing. Update: Eyestrain isn't bad at all at the 30 minute mark, but I'll do some more testing today to make sure. The Zeiss has adjustable head pieces, and a large and narrow nose piece. It's a much heavier set up, however, and so the Myvu is much more comfortable, with its adjustable nosepiece. I'd be more likely to use the Myvu out of the house, given their weight. The Zeiss has mounted earbuds on adjustable plastic sticks that don't actually interface directly with your canals. (They float over them.) The Myvu's buds go into your ears, isolate a lot more sound and produce better audio, although the dangly wires add to the clutter. The Zeiss has a really nice rubber remote with contrast/brightness settings, volume, FF/RW, Play/Pause buttons and a nice clip. That leads to the battery dock, which holds the iPod and has a power button. The Myvu's controller has individual brightness and contrast settings, plus volume, but no navigation. The Zeiss comes with a number of click in plastic holders for the touch, 3G Nano, Classic 80gb, 5th gen 60/80GB iPod, and Classic 160GB. There's no case for an iPhone the Classic 160 fit fine. There's a 1/8th inch jack for audio/video input, but a cable is not included. The Myvu comes in iPod or universal kits, but the universal kit excludes the iPod dock connection. The universal kit has adapters for regular composite jacks, Zune, Gigabeat, Archos, and 5th gen video iPods. The Myvu's cabling is also a mess, since you've got a separate battery/remote jack which interfaces with the iPod through another cable. The Zeiss's design bundles the battery with the already bulky iPod and so the only spare part is a remote. Very nice. The Zeiss has a really nice case, while the Myvu has a mere bag. If visual quality is your ultimate requirement, and you're married to an iPod, the Zeiss makes better sense. But the Myvu's ability to play with other video sources out of the box and its $100 cheaper price tag make it a little bit better for the general buyer. Both will give you a charisma penalty of 3-4 points, but you know, we don't care about that kind of thing around here.